Madera Slanted Display Case - Cal-Mil Plastic Products Inc. 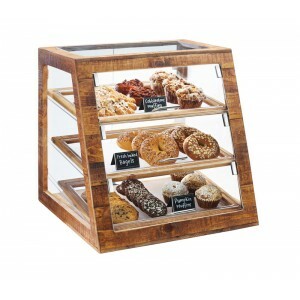 Available in Self-Serve or Attendant Serve, this slanted Madera Bakery Case is an absolute stunning piece to showcase your pastries, donuts, muffins, and more! Add our chalkboard tents to easily label your food items clearly for consumers. Includes 3-- 13"x18" Clear Trays, Removable for Cleaning. Chalkboard Tents for Labeling Sold Separately.